Some months ago I did a little post on the occasion of the 100th anniversary of the introduction of the cosmological constant which included a link to the original paper on this subject by Albert Einstein. A nice thread of well-informed comments followed that post and one of the contributors to that thread, Cormac O’Raifeartaigh, is lead author of a paper that has just appeared on the arXiv. It’s quite a lengthy paper (62 pages) that gives an account of the cosmological constant in the context of modern observational cosmology. You can get a PDF of the paper here. It’s well worth reading! We present a centennial review of the history of the term known as the cosmological constant. First introduced to the general theory of relativity by Einstein in 1917 in order to describe a universe that was assumed to be static, the term fell from favour in the wake of the discovery of cosmic the expanding universe, only to make a dramatic return in recent times. We consider historical and philosophical aspects of the cosmological constant over four main epochs: (i) the use of the term in static cosmologies (both Newtonian and relativistic; (ii) the marginalization of the term following the discovery of cosmic expansion; (iii) the use of the term to address specific cosmic puzzles such as the timespan of expansion, the formation of galaxies and the redshifts of the quasars; (iv) the re-emergence of the term in today’s Lamda-CDM cosmology. We find that the cosmological constant was never truly banished from theoretical models of the universe, but was sidelined by astronomers for reasons of convenience. We also find that the return of the term to the forefront of modern cosmology did not occur as an abrupt paradigm shift due to one particular set of observations, but as the result of a number of empirical advances such as the measurement of present cosmic expansion using the Hubble Space Telescope, the measurement of past expansion using type SN 1a supernovae as standard candles, and the measurement of perturbations in the cosmic microwave background by balloon and satellite. We give a brief overview of contemporary interpretations of the physics underlying the cosmic constant and conclude with a synopsis of the famous cosmological constant problem. I was delighted to discover that this week’s Composer of the Week on BBC Radio 3 is none other than the great Thelonious Monk, who thoroughly deserves the honour as he was enormously influential as a composer as well as a bandleader and piano soloist. Many of Monk’s highly original compositions – such as Blue Monk, Straight No Chaser, In Walked Bud and ‘Round Midnight– have become jazz standards, but his unique approach to composition really changed the entire evolution of jazz in the immediate post-war era. In fact, Monk is the second-most recorded jazz composer ever, after Duke Ellington (a man he admired enormously and whose piano style influenced Monk’s). The series of radio programmes about him is particularly timely as this year marks the centenary of his birth (10th October 1917). In my top 50 jazz albums there would probably be about half a dozen by Thelonious Monk. I’ve loved his music since I heard the very first track by him way back when I was a teenager. Although he has often been given the nickname `The High Priest of Bop’, I’ve never really thought of him as fitting neatly in the bebop style – the archetypal bebop pianist was surely Bud Powell – but he was clearly a profound influence on others of that era, such as Charlie Parker and Dizzy Gillespie. I should add that he was entirely self-taught, which is probably how he managed to get that instantly recognisable sound. You only need to hear one note to know that it’s Monk. I think the word `genius’ is extremely overused these days, and I tend to reserve it for those who show such an astonishing level of creativity that you think to yourself `Where on Earth did that come from?’. In my opinion it is no exaggeration to apply the word `genius’ to Thelonious Monk. He was a very special artist. Indeed when he was signed up by the fledgling Blue Note label in 1947, they called his first albums Genius of Modern Music.. 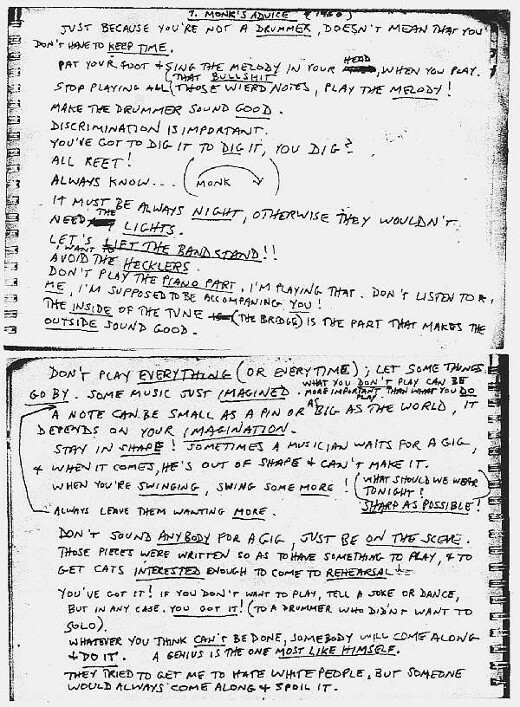 Anyway, when I listened to yesterday’s programme on iPlayer I remembered this, a compilation of Monk’s advice to band members (as collected by saxophonist Steve Lacy in 1960). As well as being in places very funny, it also contains a great deal of very sound advice for young musicians (especially the first, `Just because you’re not a DRUMMER, doesn’t mean that you don’t have to KEEP TIME’. I also like `Don’t play the PIANO PART. I’m playing that.’. I’m sure there’s a story behind every one of these tips!